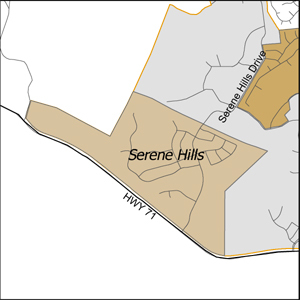 The Serene Hills Defined Area (SHDA) was created in May of 2008. The area of approximately 456 acres is located on Highway 71 West (HWY 71) approximately 3.5 miles west of the intersection of RM 620 and HWY 71, the westernmost part of the area is bounded by Bee Creek Road. District 17 supplies water to the SHDA through a 12″ waterline from the Highway 71 water tank. Wastewater service is provided by the District 17 Flintrock Wastewater Treatment Plant. Property in SHDA is being developed as single family homes, one multi-family residential development and commercial development along HWY 71. The extension of Serene Hills Drive from HWY 71 to Flintrock Road was constructed in conjunction with this project and opened in April 2011. Properties in the SHDA are taxed on an ad valorem basis to pay bonds issued to construct water, wastewater and drainage infrastructure. Based on the total amount of the SHDA bonds which were approved by the voters in the amount of $55,000,000, for improvements at final build out, the Board of Directors adopts an Operation & Maintenance Tax for the SHDA each year to retire debt service. The tax rates for the SHDA is limited by contract to a rate of $0.6500 per $100 assessed valuation. Only properties within the defined area are subject to this tax, and also pay the District-wide tax currently in effect. Construction of improvements are expected to be complete in 2019.